Khoja Gaukushan Ensemble is one of the largest ensembles in the center of Bukhara, including into UNESCO World Heritage. There used to be slaughter bulls before the construction of the ansemble, Gaukushon means "killing bulls". Hence the ensemble received its name. The ensemble consists of madrassah, the main mosque with Khoja Kalon minaret, which size is second only to the Kalyan minaret. 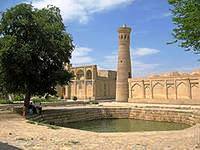 Madrasah was built in 1570 during the reign of Uzbek Khan Abdullah Khan II. The building had a traditional yard scheme with a trapezoidal shape. Friday Mosque Khoja was built in the north of the madrasah in 1598. Khoja Gaukushan Ensemble was erected at the expense of Djuybar Sheikh, known as "Khoja Kalon" ("great Hodja"), who was later buried in the family necropolis Chor-Bakr.